I know why I’m a member of Arizona Farm Bureau: the organization supports our state’s farmers, ranchers and dairy farmers. And, if you’re reading this and you’re a member, you know too. But check out the 29 Arizona agriculture farmers and ranchers and what they say about being a Farm Bureau member. Saylor Family: Farm Bureau has been everything to me from an agricultural standpoint. I’ve often heard it said that you need community and organization to be in a positive group. That’s what we have in Farm Bureau. We have an amazing community; it’s a real family ─ from young to old ─ everybody has a place at the table. I just love that aspect of Farm Bureau. I love to see the young leaders coming up and I love to see the older generation still hanging in there. And, everybody needs community. Secondly I love organizationally how Farm Bureau is set up. It’s grassroots. Everybody has a voice to be heard. Plus, there is an opportunity for everyone to be involved. Newbold Family: Farm Bureau is a true grassroots organization. It gives us a chance to have a voice in the process that outlines our industry. Claridge Family: Years ago, I was talking to a fellow farmer. I told him that in our valley that agriculture needs to be promoted a little more to the public. He took that as an interest in Farm Bureau and it influenced his personal involvement in Farm Bureau. Farm Bureau has a great ability to lobby for our agriculture issues. Debbie added: Farm Bureau has given us a lot of opportunities, especially when Mark was County president, but for both of us to also lobby on behalf of the industry including going back in Washington, D.C. to talk to our Congressional representatives, including lobbying on issues that are pertinent to our community. It’s nice that he and other farmers can have a voice in Washington D.C. about what’s important in our community. For a small community, who knows more about that community than those of us from our farming communities? Hickman Family: Farm Bureau advocates for all of agriculture. We need every voice we can get. McGuire Family: Why am I a Farm Bureau member…? WHY NOT! It’s a lot of good stuff, I am always getting something out of everything that you all do. Being involved in the Young Farmers and Ranchers group is always a good time, to see how agriculture is all over our state is so rewarding! McNelly Family: The Farm Bureau is connected with the Cattle Growers here, and I think it is important because we have lobbyists watching out for us, and people are on the frontline to carry bills for us. Sometimes you just need some help, and that’s where the Farm Bureau comes in. It has been fun, and I have met some really nice people; I think has entirely helped my communication skills. Farm Bureau has also allowed me to make some great business contacts I would not have otherwise met. I’ve actually sold some cattle to people I’ve met through these organizations so it’s helped the business in more ways than one. It helps me work smarter. Pearson Family: Farmers need an advocate and the Farm Bureau does just that. Lobbying for farmers to make sure our needs are known and met. Hatley Family: I’m active in Farm Bureau because they’re great advocates for farmers and ranchers. Caywood Family: We are members of farm bureau because we believe in agriculture. Farm Bureau addresses ag-related issues and through their meetings and newsletters, we can stay informed on current issues. Nancy is a member of the Farm Bureau in both Arizona and California and was the Imperial County Representative to California Ag in the Classroom. Nancy is interested in Arizona Ag in the Classroom and would like to become active. Ware Family: I am a Farm Bureau member because I believe in what they stand for and I have never been let down by this organization or the people involved in it. Ott Family: We are Arizona Farm Bureau members because of their efforts to keep lawmakers informed of agricultural issues and for always fighting for American Agriculture. Thelander Family: Farm Bureau fights for Arizona Agriculture. They fight for our property rights, our water rights, and helping move agriculture forward. It means so much to me that agriculture is around for the generations to follow and Farm Bureau is assisting the farmers and ranchers in keeping agriculture around, and a thriving industry. Gasho Family: We got involved in Farm Bureau at the invitation of Ann and Paul Palmer. We were interested because of staying abreast of issues. We stay in Farm Bureau for that reason but also for the legislative lobbying, advocacy for agriculture, it’s well organized structure and influence, great resources like Ag in the Classroom, and the community. It has afforded us the opportunity to develop value leadership skills through programs like Effective Communications and the Women’s Leadership Boot Camp. After attending a national women’s convention, I learned about ANNIE’S project and became the state coordinator for Arizona. Annie’s provides risk management education for farm and ranch women with guided learning in a safe harbor setting. Glenn-Kimbro Family: It was the right thing to do. The Farm Bureau stands for what is good and right. Murdock Family: We appreciate all that Farm Bureau does in dealing with important matters, with the legislature, and all sorts of matters regarding farming and ranching. 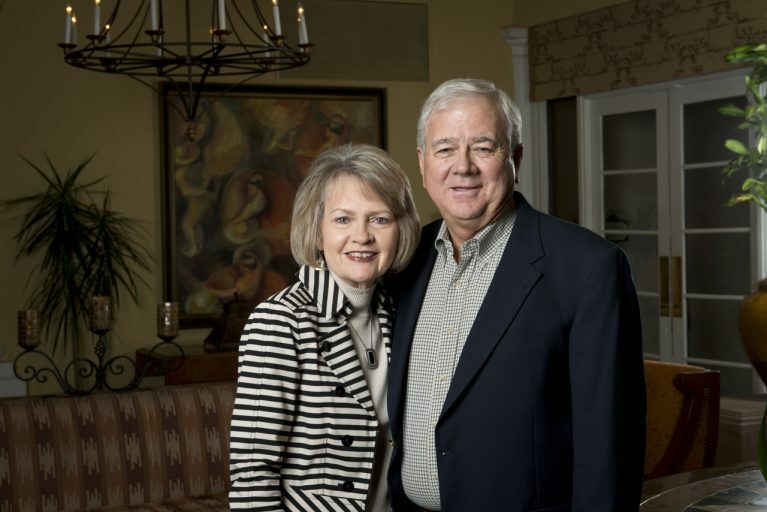 Murphree Family: Farm Bureau keeps us in touch with what’s going on. We’ve always been Farm Bureau members. When in farming we were also always Arizona Cotton Grower members. We’ve seen the value of membership in both of these organizations. It’s good to be commodity-specific to keep updated on changes in your agriculture field; but Farm Bureau grassroots advocacy is much broader based. Morrison Family: From my childhood I viewed Farm Bureau as family. Though I didn’t spend as much time with Farm Bureau as I would have liked while practicing law on a full time basis, I have transitioned now into a part time arrangement with the law firm. I hope to spend more time in the next several years working on Farm Bureau policy, because I also think Farm Bureau is a very effective advocate on Ag policy issues. I try to participate in the annual policy meetings when invited. Sloan Family: Farm Bureau members help to encourage understanding in the general public where food actually comes from. There are benefits for places you shop at, but most of all, we love what Farm Bureau stands for. We have been members for 40+ years, and love it. Creech Family: I could get insurance somewhere else but everything about Farm Bureau is based and geared to farm life and the unique aspects of farm and ranch businesses. I can call anytime and there are resources galore. Kerr Family: They helped me out with some issues a few years ago. Farm Bureau helped me to get heavily involved and enabled me to speak to various groups in public. I believe all these improvement in leadership and speaking help me protect my livelihood. It gives me a voice. Anderson Family: Farm Bureau is truly “The Voice of Agriculture.” As GMO fear grows and water issues become increasingly difficult, the general consumer needs to know how we are adapting and becoming more sustainable to help protect the environment and the limited resources we have. I am especially grateful now to benefit from the water storage that Arizona has invested in many years ago, due to the efforts of the Farm Bureau lobbying to make sure our needs are known and met. I see the foolish people in California complaining about farmers turning the desert into a water-hungry, wasteful eco-disaster and I know that there is a huge need to educate these people on where their food comes from and what we do to make sure everyone is benefiting from our efforts. It’s disturbing to hear the hypocrites saying eat your Organic veggies and keep GMOs out of our food supply, but they have no idea of how much benefit the research has brought to reduce the use of airborne pesticides and creating varieties that are drought tolerant. Farm Bureau is absolutely essential to helping the customer base understand our industry and what we have done to create a safe, diverse, and sustainable food system. Mortimer Family: We have been Farm Bureau Members since 2000. We love to be involved with other people who work the land and can learn tons from each other! The Farm Bureau has a wonderful education program – for youth and adults and helps us to be successful on and off the farm every day! Johnson Family: I am a Farm Bureau Member for a couple of reasons; the biggest reason would be to stay involved in helping agriculture progress. I believe it needs a voice!! Another reason is to meet and stay in touch with people that are involved in agriculture. Hauser Family: I have been a member for over 50 years. I have been President of Apache County Farm Bureau up here for several years. You definitely meet quality people through the Farm Bureau, that’s for sure! Cullison Family: Because of what they stand for. I like that they advocate for farmers like me, that don’t have the time to drive up and voice my concerns or needs. I also love that they have an educational program that advocates to children who do not get to see agriculture every day. I have met many people who have no concept of where their food comes from. I’m glad someone is taking the initiative to make this change and dissolve these misconceptions. Graham Family: I joined Farm Bureau when I began farming in Iowa back in 1973. Admittedly joining was primarily to buy insurance and I didn’t take a very active part in the real benefits of the organization. When Ruth and I moved to Arizona I became more interested in participating because we recognized how important being part of the “voice for agriculture” was in a state where agriculture is too often viewed as insignificant. Having the opportunity to educate the public through Farm Bureau activities has been very satisfying to us. Caballero Family: I believe it is very important to have the voice of the Farm Bureau to support and educate in agriculture. In my mind, we need to stand united in agriculture, period. There once was a time if you were a part of one side of agriculture, the other side almost looked at them as your competitor, or enemy. I believe those days are days of old. If you are a chicken guy; you better be aligned with the dairy guy and if you are a dairy guy; you better be aligned with the beef guy; if you are a hog farmer you better be aligned with the corn farmer. As a group of agriculture, we are really small and we must all be united! Through Farm Bureau they are our conduit to allow us to do that. Van Hofwegen Family: Farm Bureau is a great advocate for the dairy industry, they have many resources which we can use to help support our industry. I did join for insurance reasons originally. If you have questions about Farm Bureau’s member benefits, contact Peggy Jo Goodfellow at 480.635.3609 or email her at peggyjogoodfellow@azfb.org. This entry was posted in Arizona farmers and ranchers, Members and tagged Arizona Farm Bureau, Arizona farmers, Fill Your Plate, Members. Bookmark the permalink.